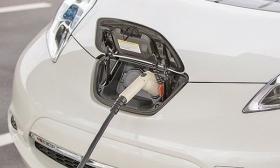 Is CHAdeMO headed for CHAde-NO? Jim Treece is our former Retail Editor. The Nissan Leaf includes a CHAdeMO port next to the SAE-spec port. DETROIT -- When I opened the charging door on the passenger side of the Mitsubishi Outlander PHEV plug-in hybrid crossover, I found a charging port and a large empty space covered with a flat slab of plastic. The charging port is the same SAE-standard version I have on my Chevrolet Volt. The empty space? That’s where a large CHAdeMO port should have been. CHAdeMO is a high-speed direct-current charging protocol for plug-in vehicles being promoted by Japanese automakers and power utilities. U.S. and European automakers have lined up behind another high-speed charging protocol, in a standards battle that inevitably draws Betamax vs. VHS comparisons. The Outlander PHEV was on display here at a reception Mitsubishi held ahead of the Detroit auto show. Mitsubishi won’t be taking part in the Detroit show, and the Outlander PHEV’s official auto-show debut will be in New York this spring ahead of its sales launch in August. The U.S. version of the Outlander PHEV plug-in hybrid crossover will go on sale in August. Why no CHAdeMO port? Ken Konieczka, vice president of sales operations at Mitsubishi Motors North America Inc., said the company decided to omit the port from the U.S. version of the crossover, even though it’s standard on the Japanese model, because there aren’t enough CHAdeMO charging stations in the U.S. to make it worth including. The Nissan Leaf includes a CHAdeMO port next to the SAE-spec port. But if Japanese automakers such as Mitsubishi start abandoning CHAdeMO for their U.S. vehicles, that can’t be good news for the CHAdeMO backers. We’re going to see a lot more plug-in hybrids at the Detroit show and other auto shows this year, as the fuel-saving technology gains traction. Keep an eye on who does and doesn’t include a CHAdeMO port.